The dull green, purple or bronze globe artichokes are from the Thistle family. The part we can eat is the immature flower- bud, (inedible once opened). In mature artichokes the ‘hairy choke’ that lines the edible heart is actually start of the flower development. The largest bud, which sits at the top of this huge plant can way upwards of 500g. A large bowl of cold water with juice of 1 lemon squeezed in. A large stainless steel/cast iron or enamel pot. Trim each stalk to 6cm in length. Work with one artichoke at a time. Snap off the first few layers of leaves until you see a soft green base to the leaves. Lay artichoke on its side and cut the top third of leaves off, straight across, (the pointy part). Rub all exposed surfaces with cut lemon, then place into the cold water. Bring the large saucepan of water to the boil, add salt, bay leaves and sliced lemon. Drop all the artichokes into the boiling water and cover with an upturned plate (to hold them down). Boil for 15 minutes. To test if they are cooked, lift one artichoke out and run a thin skewer or small knife through the thickest part. If there is slight resistance then they are cooked. If the centre is hard then return to cook for a further 5 minutes. and whisk through with a fork. Turn the right side up, use your fingers to turn spread the leaves a little. Spoon over a little vinaigrette. Arrange on serving plates, trim the stalk down, spoon over extra vinaigrette. The stalk is edible; you may like to peel away the outer edge if it is tough. Pull out a leaf and scrape the fleshy side of the leaf against your teeth, then discard the leaf. 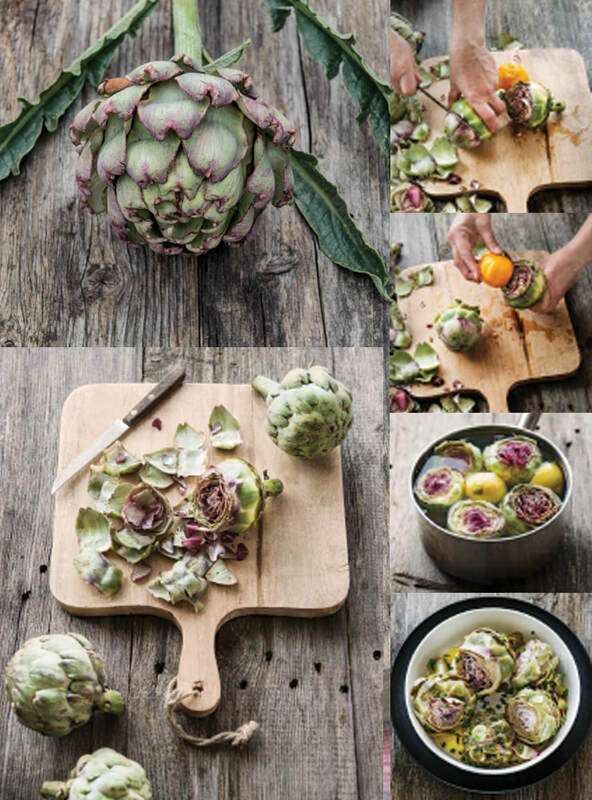 Once you have removed all leaves, you will find the tender heart of artichoke which can be sliced and enjoyed with the tomato vinaigrette. To enjoy the flavours of the tomato vinaigrette, serve with a fresh light artisan bread loaf, to mop up the juices.